This week’s charts show that if we were serious about improving the competitiveness of American producers, we should be looking at policies that help all producers rather than to the Export-Import Bank, which benefits mostly a few winners. Proponents of the Ex-Im Bank often argue that its export credit subsidies to foreign buyers “level the playing field” in international trade. Supporters claim that similar activities from foreign export credit agencies (ECAs) like the Compagnie Française d'Assurance pour le Commerce Extérieur in France or the Export-Import Bank of Korea necessitate the defensive actions of the Ex-Im Bank. According to this argument, all American exports would suffer a great deal if the Ex-Im Bank were not able and willing to counteract these foreign subsidies. But this justification for the Ex-Im Bank’s activities is based on several assumptions with little factual support. 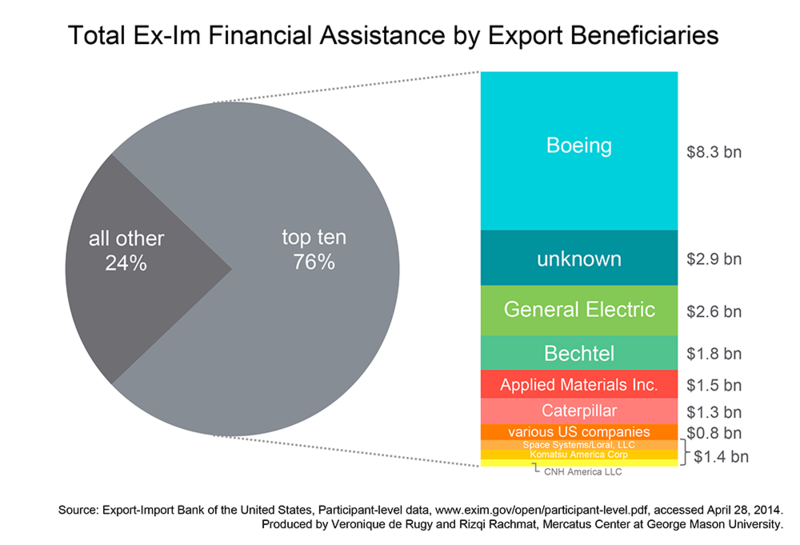 First, it implies that a significant portion of US exports are dependent on Ex-Im Bank financing, but roughly 98 percent of the value of US exports receive no Ex-Im Bank assistance at all. In other words, absent the subsidies most US exports would be unaffected. Second, it incorrectly assumes that all of today’s backed exports would disappear without the subsidies. This is unlikely to be true, considering that a vast majority of Ex-Im Bank activities benefit only a handful of giant corporations. These companies should have little trouble arranging alternative financing for some of the sale of their products, especially in light of how wealthy the buyers are. In addition, by focusing so much of their arguments on the need to help US exporters compete with subsidized foreign competitors, Ex-Im Bank advocates may have mislead people into thinking that most Ex-Im Bank activities are dedicated to fighting off foreign subsidies. However, the data shows that less than one-third of the Bank’s FY 2013 portfolio goes towards the stated goal of “meet[ing] competition from a foreign, officially sponsored export credit agency.” At the very least, one may then ask what is the justification for the other Ex-Im-backed transactions? This week’s chart combines the three points above into one graphic. Using data from the US Census Bureau and the Export-Import Bank, the chart shows the total value of all US exports, along with the total value of exports claimed to have been assisted by the Ex-Im Bank. To the right of the chart, this amount of Ex-Im assistance is broken down into the categories that the Ex-Im Bank lists in its annual reports. 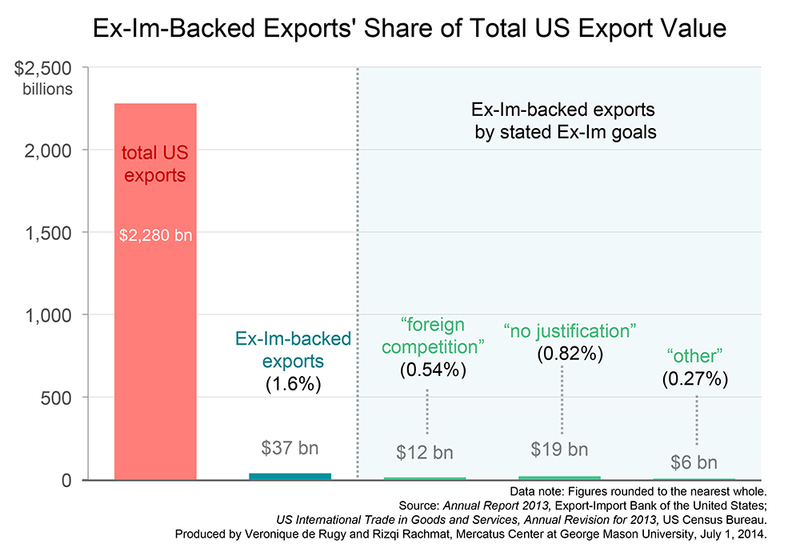 As the chart demonstrates, the Ex-Im Bank’s primary focus isn’t to protect a significant portion of US exports from foreign subsidies. In fact, only roughly one-half of one percent of the value of US exports last year even fell into this category. More Ex-Im Bank activity was dedicated to no justification at all than to this purportedly critical role the Bank plays fending off foreign ECAs. Many Ex-Im Bank supporters genuinely want to help US exporters and their employees remain competitive on the international stage, and I share their goals. There are better ways to improve the competitiveness of US exporters. As part of this process, the federal government must maintain pro-growth policies to help all American businesses, not just a few selected ones, deliver the best products and services at the best prices. One simple reform would be to improve our stifling corporate income tax system. 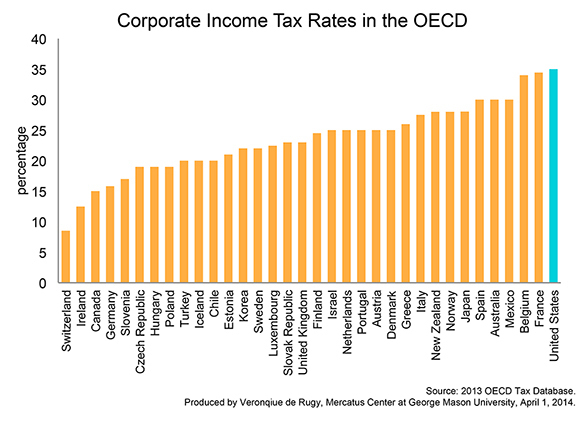 As my previous chart series demonstrates, the US has the highest corporate income tax rate among all OECD nations. Unlike the Ex-Im Bank, which merely redistributes success from unsubsidized firms to subsidized ones, reforming the corporate tax system would benefit all US businesses—exporters and non-exporters alike.